In yesterday’s post, I mentioned discovering that my soon-to-be-released A Month of Sundays: 31 Meditations on Resting in God is now up on the website of Reformation Heritage Books. Copying those links for this post, I made another discovery. The rolling ads at the top of RHB’s homepage feature Little One Lost: Living with Early Infant Loss. RHB is selling Little One Lost for only $8 and offering A Month of Sundays for only $7.50! A Month of Sundays begins with God’s creation ordinance for weekly rest and shows how we are to rest every day by trusting in God’s sovereignty and obeying his statutes. It meditates on selected passages throughout Scripture, ending with a look at the believer’s glorious future of rest. In today’s hectic and distressing world, demands and distractions agitate our spirits. Disasters trigger anxiety. Diseases generate pain. Despair creeps into our hearts. These influences displace our peace and keep us from resting daily in Christ and His Word. How can we recapture the concept of daily rest? 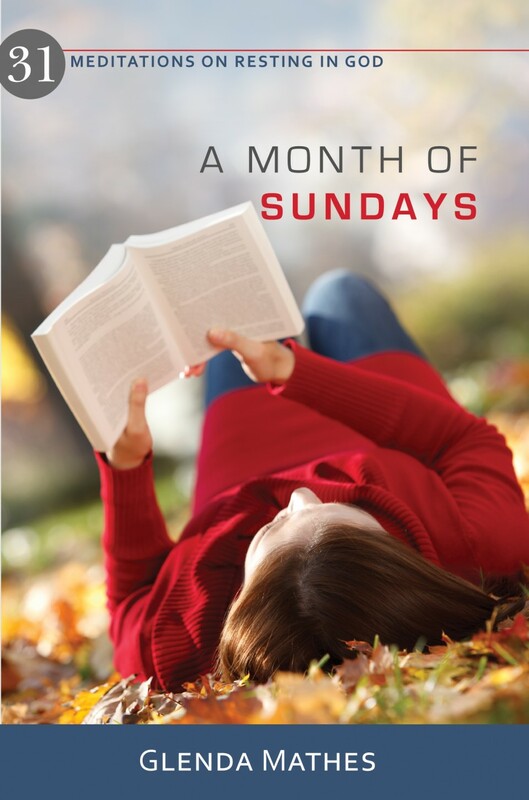 In A Month of Sundays: 31 Devotions for Daily Rest, author Glenda Mathes encourages us to pause our spinning thoughts and calm our fluctuating feelings as she helps us to see that we must be true Sabbath keepers, understanding that God has called us to develop daily the attitudes of worship and rest we enjoy on Sunday. With a recommended Scripture reading, a focus verse (or verses), a meditation, and questions aimed at stimulating personal reflection, each devotion guides us to experience a “month of Sundays,” as we experience a greater enjoyment of God’s gift of daily rest while we anticipate His guarantee of eternal rest. The concept of rest permeates the Bible from creation to consummation. After God created and named the different aspects of our universe in six days, He rested. When Christ returns to complete His kingdom, all believers will enjoy perfect rest. Between these two great bookends of history, God calls us to rest in Him every day. In today’s hectic and distressing world, we need to recapture the concept of daily rest. Demands and distractions agitate our spirits. Disasters trigger anxiety. Diseases generate pain. Despair creeps into our hearts. These influences displace our peace and pull us from resting in God and His Word. The reflections in A Month of Sundays: 31 Meditations on Resting in God pause our spinning thoughts and calm our fluctuating feelings. Head over to the Reformation Heritage Books website and check out the listing for A Month of Sundays! While you’re there, you may want to click on the “more details” button of the Little One Lost scrolling ad. Little One Lost helps those grieving the loss of an infant through miscarriage, stillbirth, or newborn death as well as those who seek to minister to them. But it also helps anyone better understand such losses and the pain of infertility. Much of the discussion about grief can be applied to any loss. At $8 for Little One Lost and $7.50 for A Month of Sundays, you can’t beat RHB’s prices! Spread the word. Tell your friends. Support starving artists. But most importantly, promote Christ’s kingdom.